It must be a touch of Spring Fever, or the fact that I finally need to get outside and start doing all the yard work I put off in the Fall because I was using the colder weather as an excuse to stay indoors! Either way, April and May episodes are a little sparse. But that doesn’t mean I’m going away for long, just tidying things up so I can devote more time to the shop. In the mean time, I’ll be posting more Spoken Wood Podcast episodes, more Wood Talk Online Radio episodes as they become available and even the return of The Review Show as soon as I throw the kids out of the living room and reclaim my easy chair and remote control. If you haven’t seen my “The Accident” video yet, you may want to check it out before you visit this link to my good friend Chuck Bender’s post over at his blog “Parings – A Woodworker’s Journal” Safety Week 2012 – Matt Vanderlist’s video. Shortly after posting my episode about the accident Chuck contacted me to ask if he could write a post on his own blog talking about the incident, and then providing some more insight into what could’ve been done to prevent it. It’s never easy to admit when you screwed up, and it’s even harder to listen to what someone else has to say about it. But the fact is, I wanted as many people as possible to learn from my mistake so hopefully they won’t make it themselves. The goal of my video was to point out what I thought were the mistakes and missteps I made that contributed to the whole incident. What Chuck did was to take it one step further and nail them home. Take a few minutes and read what he has to say. I know I did, and I can confidently tell you I’m very appreciative of the insight I’ve gained from it. Don’t get me wrong, it’s hard for me to read some of what Chuck wrote. When you make a mistake as major as I did, it’s difficult to hear what someone else has to say about it. But I can guarantee the next time I fire up any of my routers, it’s Chuck’s advice I’ll be using to make it a safer task. The fact that you were thoughtful enough to post this video as well as describe what you think you did wrong , speaks volumes in and of itself. Then to be able to post about what others think and or publish about you says even more. I read the response that Chuck did and it was great. Both discussions yours of “The Accident” and Chucks review are mutually accepted with appreciation to share. 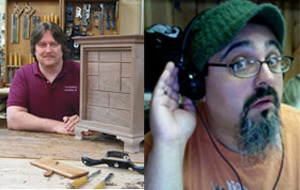 In Chucks article , he does a “Conclusion”, which in the context of both your video/blog and the breakdown of the process, which alluded to the accident, helps all woodworkers Beginner thru Master Craftsmen alike to Think!, before proceeding. I appreciate all that you share, as I look forward to learning this craft a little more with each step. As I read your insights into the accident and safety, I think you bring a perspective to the table that most are missing. We can review all kinds of accidents to consider what might have been done differently, but it’s the guards, and push sticks, and habits that we put in place beforehand that save us when all goes bad. We need best practices, and safe procedures, because that is generally what keeps us safe, just like rules of the road and a well maintained vehicle on the road. But just as some of us will someday need seatbelts and airbags as a last resort in our vehicles, we also need guards and SawStops in our shops. We don’t drive recklessly just because we are wearing seatbelts. But we survive with relatively little damage that one time, and go on to drive again. I only needed a SawStop once. If I’d had it, it would have saved the cost of surgery 5 times over. Calvin thanks for the feedback, I hope you’re doing ok from the accident.